PC gaming is a serious pastime for many people around the world, and a true gaming experience is all about the PC. 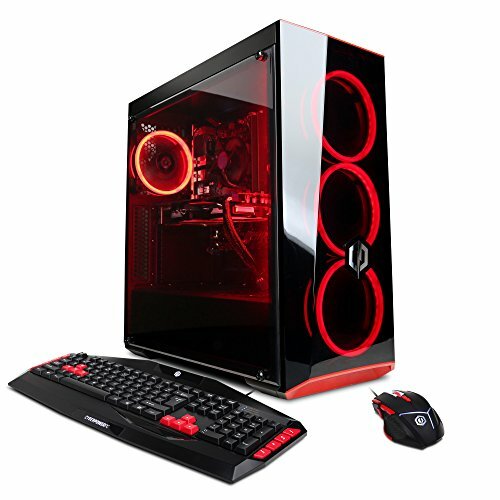 Gamers understand that the proper computer is essential to their gaming performance; but which PCs are best for gaming? There are many things to consider when choosing a new PC, and if you have a budget to consider, it can make your options more difficult. If your budget falls below $1,000 you may feel restricted, but with the right PC, your money can go a long way. 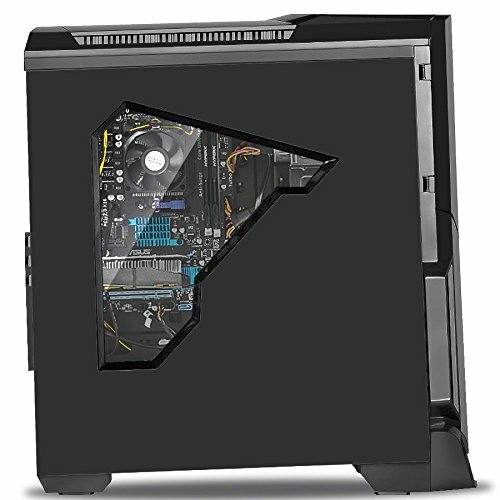 Before jumping into the purchase however, you should consider a multitude of factors to ensure you choose the best gaming PC under $1,000 for you. Whether you’re building or customizing your own unique PC, or looking to find a prebuilt beauty, you’ll need to discover what is most important to you. Graphics are an essential part of the gaming experience, since most of the experience is visual. Trying to find the highest-end graphic card for the least amount of money can be challenging, but you’d be surprised what a $1,000-budget can get you in the graphics department. In addition to a high-performing graphics card, you’ll want to pay attention to the PC’s processing type and speed. Gamers need a fast processor to keep up with the amazing technology in the latest games. In addition, you’ll want to ensure your new gaming PC has enough memory and storage to not only save all of your important files, but also to be able to run each and every program you choose to have. Having a PC with too little memory or storage can drag your computer down and ruin the gaming experience. And if you are going to be purchasing a pre-built PC and don’t have a lot of tech-experience, the warranty may become an important factor as well. 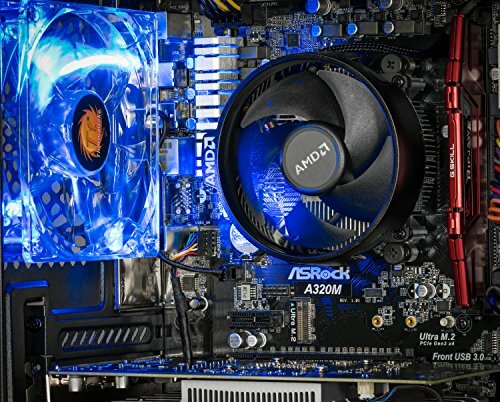 What type of PC games you play can also determine important needs in your next gaming PC. If first-person shooters are your favorite, you may consider a PC that places graphics as a higher priority than CPU performance. War games require a faster CPU, and real-time strategy games need a delicate balance between the two. The following 10 gaming PCs for under $1,000 are full of variety and sure to provide you with everything you need to maximize your gaming experience. 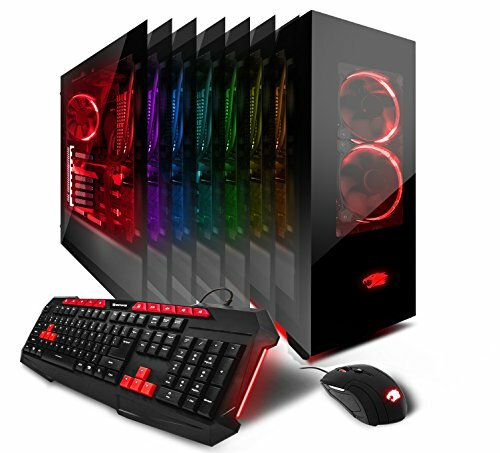 This beautiful, black, sleek gaming PC has great red accents and is available as a desktop or desktop/monitor combo. Both options come in under the $1,000-mark, making it a great option for any gamer. 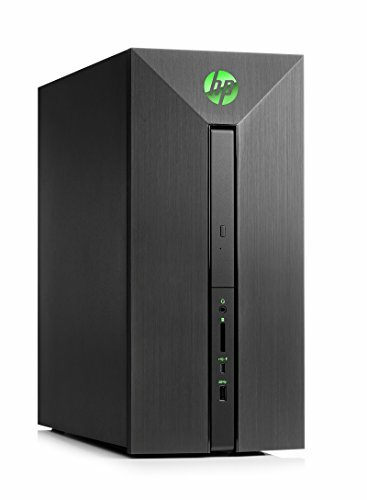 The desktop features a sizeable 1TB hard drive and an Intel Core i5-7400 3.0 GHz processor. It uses the Windows 10 Home operating system and comes with 7 various USB ports. And while there is free lifetime tech support, there is only a 1-year warranty for parts & labor. CyberpowerPC enables their PCs with both ethernet and Wi-Fi-network capabilities. It comes with a 4GB video card and 8GB of RAM, which should be considered middle-of-the-road in size. The Gamer Xtreme is also virtual reality-ready and optimized for gaming with high resolutions and game settings. It features a performance AMD Radeon graphics processor, and comes complete with a gaming keyboard/mouse. The Gamer Extreme is relatively low on processing power, making it a better choice for strategists or first-person shooters. This cool black/green desktop seems to have smaller processing power at 3.0GHz, but by using the Intel Turbo Boost Technology, you can use the Intel i5-7400’s 4 cores to boost your power up to 3.5GHz. It comes with an impressive 1TB hard drive, and uses the Windows 10 operating system. While it may come with a medium-sized 8GB of RAM, this premium gaming desktop only features a 3GB NVIDIA GeForce GTX 1060 graphics card. For the money, you don’t have to sacrifice much power with this beauty. And even though the graphic specs may not be phenomenal, the desktop is virtual reality-ready and produces a digital resolution of 7680×4320 @ 60Hz. HP only offers a limited warranty, but has great online technical support available always. Other features included with the 580 include keyboard/mouse, a DVD-writer, DTS studio sound, 3 USB ports, and a 7-in-1 memory card reader. The HP-580 is also ethernet, Wi-Fi, and Bluetooth-network capable. The GTX 1010 Ti features an AMD FX-4300 processor that puts out a more-impressive 3.8GHz of power. It also uses a 4.0 turbo quad core, so it has quick enough processing power to maximize any game. It also comes with a large hard drive space of 1TB, and a medium-sized gaming memory of 8 GB. The Shadow comes with a more impressive operating system: Windows 10 Professional, and comes with an average year-long parts & labor warranty. Skytech does however, offer lifetime tech support to all customers. While the graphics card is not grand, it’s perfectly suitable at 4GB. But even at just 4GB, the Nvidia Geforce graphics card gets the job done. The desktop also comes with an incredible 9 USB ports and an HDMI port. The Shadow GTX is Wi-Fi-ready and comes with heat-spreading technology, so your hardware will never suffer. And one of the best parts of this PC? There is absolutely no bloatware, so when you start up your PC for the first time, it only has the programs it needs. 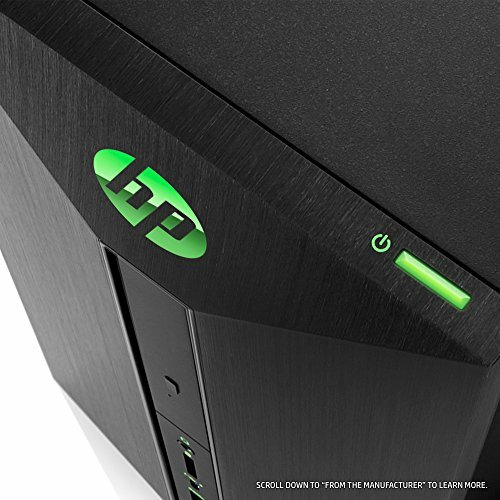 This HP boasts a bigger, Intel Core i7-7700 that uses 4-cores to run 3.6GHz of power. The GHz may not be as high as others, but it’s powerful enough to keep up with multitasking demands. The graphics card may be the most disappointing of all the specs, considering it only contains 3GB of dedicated NVIDIA graphic space. The 580-068 comes with the same cool, black/green design as the other 580 on the list, with the same tech-support warranty. While the graphics card may not be high-end, if you’re looking for a PC with memory and hard drive space, this may be the pick for you. It comes with an impressive 16GB of RAM and 1TB hard drive space. And if that wasn’t enough, it also comes with an added 128GB solid-state drive. The 580-068 also comes with the Windows 10 operating system, keyboard/mouse, 5 USB ports, a HDMI port, and a 7-in-1 card reader. With less network capabilities than some others, this PC may be considered a more ‘classic’ gaming computer. It only uses ethernet connections, but comes with a great 1-year parts & labor warranty. It uses the latest Intel i7-7700 4-core processor, which produces a relatively fast 3.6GHz. But if that speed isn’t fast enough, the AM901Z also comes with a turbo option that boosts the processing power to an amazing 4.2GHz. Included with the impressive processing power is an average-sized RAM space of 8GB, a massive hard drive-size of 1TB, and the Windows 10 Home operating system. The dedicated GTX 1060 graphics card is only 3GB, but that size is suitable for most types of games. The PC also comes with 6 USB ports, keyboard and mouse, 16 color RGB lighting, and a Wi-Fi USB adapter. 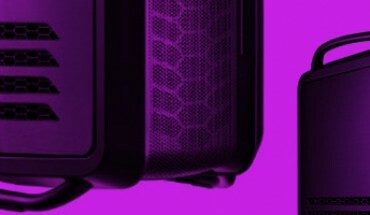 And if you’re someone who enjoys the aesthetics of your products, the AM901Z is beautifully, vibrantly designed with bright colors and a see-through panel that allows you to see the PC’s innerworkings. One of the seemingly small features on this desktop can be extremely important to gamers. It comes with absolutely no bloatware, so your computer is empty (without pre-installed programs) and ready to store anything you need right out of the box. This feature helps maximize the PC’s relatively slower AMD Ryzen 3 1200 3.1GHz processor. And while the ArchAngel does come with a boost feature, it only increases the power to 3.4GHz. In addition to zero-junk on your PC, the ArchAngel Ryzen 1200 boasts a 1TB hard drive, an average-sized 8GB memory operating at 2400MHz, and a relatively small 3GB graphics card. This PC is also Wi-Fi ready, operates on the Windows 10 Home system, and has an amazing 9 USB ports. 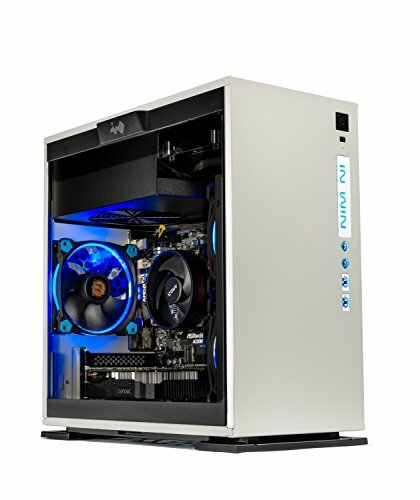 Unlike many other PCs, the Ryzen 1200 is designed in a clean, white color; complete with futuristic, blue accents. All Skytech gaming PCs are protected under a 1-year parts & labor warranty and a lifetime of tech-support. This PC is also virtual reality- and 4K-ready. 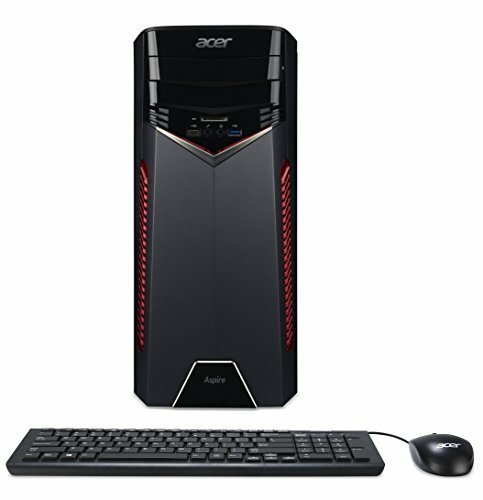 Acer is known for putting some serious innovation into their computers, so it’s no surprise that this PC is one of the most popular amongst gamers. It comes with an impressive 8-core AMD Ryzen 1700X processor that produces up to 3.8GHz of power. There’s no turbo on this desktop, but 3.8GHz is fast enough for even the most serious gamers. It uses the Windows 10 Home operating system, and comes with a limited 1-year warranty (though you can purchase additional, extended warranties). If you need a PC with plenty of RAM and storage space, the Aspire PC hits all the marks. It comes with both a 1TB hard drive and a 256GB solid-state drive; plus, 16GB of RAM running at 2400MHz. Not only is that enough storage, but also plenty of memory to run any game. It has a pretty small graphics card in comparison to other models, at 3GB, but it can support up to 4 monitors for maximum multitasking. It is also virtual reality- and 4K-enabled, but doesn’t have the innovative look that other options have. The Omega Mini is another great gaming option by Skytech Gaming. It uses an incredible 6-core AMD Ryzen 5 1600 processor that produces 3.2GHz of power. That number isn’t great, but it also comes with a turbo feature that boosts the power up to 3.6GHz. Unlike other PCs on the list, the Omega Mini has only a 500GB solid-state drive, so extra hard drive-space will be up to you. It does however, use the latest 3D NAND technology. Though the PC seems to lack in hard drive space, it does have sizeable RAM space at 16GB (with heat spreader). The Omega Mini runs on a Windows 10 Home operating system, and uses a 4G graphics card; larger than many others. Skytech installs zero bloatware on this PC, and also made it Wi-Fi ready. It also comes with a keyboard and mouse, plenty of USB ports (8), and a 1-year limited warranty. This beautiful, white desktop features a futuristic aesthetic, with unique honeycomb-shaped inlays. This gaming PC by CyberpowerPC falls just under the $1,000 mark, but it has a high-quality Radeon RX 580 4GB video card, and a 1TB hard drive. While the 8GB of RAM may not be optimal, CyberpowerPC added in a 16GB Intel Optane Memory Accelerator to boost power even more. And for those concerned about the appearance of their PC, this desktop is certainly winning in that category. 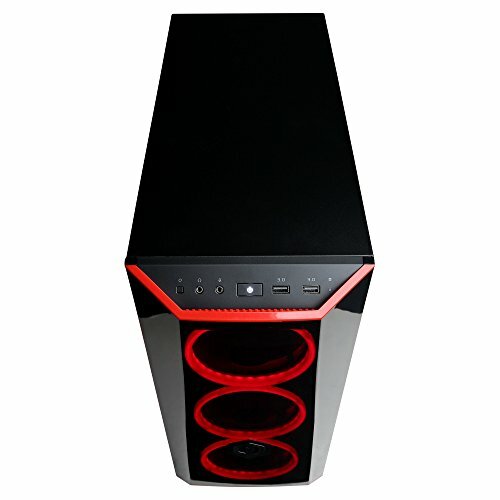 It is black and red in color, but features a full-size window panel on the side case that allows you to see how the PC works. The PC only has ethernet network-capabilities, but it comes with a cool 8 USB ports. The Gamer Xtreme also comes with 2 display ports, so you can run up to 2 screens at a time. It runs on the Windows 10 Home operating system, comes with a keyboard/mouse, is virtual reality-ready, and offers a 1-year parts & labor warranty. CyberpowerPC does however offer free lifetime tech support to all of their customers. 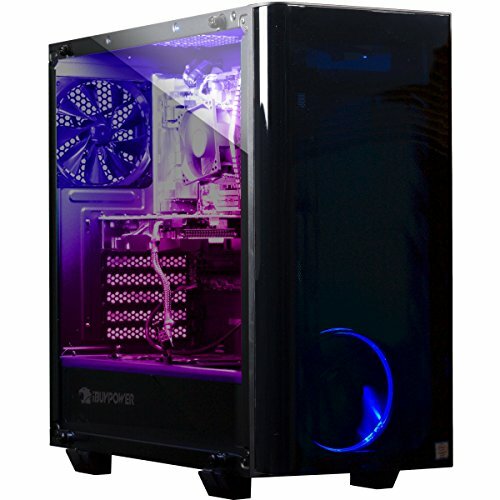 Much like the other iBUYPOWER computer products, this gaming PC features amazing aesthetic features that make it hard for gamers to say no. Black and red in color, the PC sits above the ground and features 2 see-through panels to see both the fans working, and the innerworkings of the desktop. It uses an average-sized 3.6GHz AMD Ryzen 5 processor that can be amped up to 4.0GHz with the turbo feature. It has a 1TB hard drive, but also an additional solid-state drive with 120GB. The AM807Wa also comes with a sizeable 16GB RAM and iBUYPOWER’s 1-year parts & labor warranty. The dedicated graphics card could be better, but 3GB is good enough for most gamers. It runs on the Windows 10 Home operating system, comes with a Wi-Fi adapter, and is virtual reality-ready. It also comes with 6 USB ports, a keyboard and mouse, and RGB lighting with remote.